Where All The Neighborhoods Still Meet! 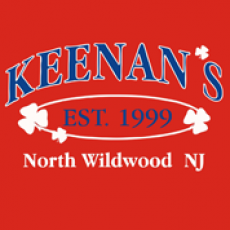 Keenan's North Wildwood is located in the heart and soul of North Wildwood, at 113 Olde New Jersey Ave., 'Where all Neighborhoods Still Meet! ' Family owned and operated since 1999, Scott Keenan, along with his Mom, Peg; Dad, Jack (recently passed); and brother, Sean; love what they do and do what they love! You can feel it when you walk through their doors. With 25,000 sq. feet of wall to wall FUN, where else can you find 4 places to hang under one roof?! Next time you head down the shore. Make Keenan's your favorite spot whether you are with family or friends, sitting down to mouth watering crabs at Peggy's Crab Shack or just chillin' with an ice cold drink and jamming to great live music-this place has got it all!